Lieutenant Robert Clarence Marvin was born on February 10, 1940 in Boone, Iowa to Mr. and Mrs. Clarence R. Marvin of Dexter, Michigan. Robert is a 1958 graduate of Greenville High School in Boone, Iowa. Bob earned a Navy Scholarship and attended the University of Michigan where he was a member of the Naval ROTC program. He was commissioned upon graduating in 1962. Lieutenant Marvin flew 111 missions from the U.S.S. Kitty Hawk before going to the U.S.S. Hancock with VA-115, Task Force 77, 7th Fleet operating in the Gulf of Tonkin, North Vietnam. According to a synopsis written on the POW Network, "On February 14, 1967, Marvin flew an A1H (Skyraider) from the Hancock on a mission. His plane developed trouble shortly after takeoff. He and his wingman turned to return to the carrier, but Bob's engine stalled and cut off all electrical power, so no radio messages were received from him. His wingman tried to set a glide path to conform to the powerless glide Marvin's plane would be in, but never caught sight of Marvin's plane. The day was overcast. The Navy searched the area for two days but did not find any debris or sign of Marvin or his plane." Robert Clarence Marvin is survived by his parents, wife, a son, and a brother. He lived 27 years, 3 months and 14 days. He was awarded 10 Air Medals, the National Defense Medal, Navy Commendation Medal and the South Vietnamese Government's Armed Services Expeditionary Medal. 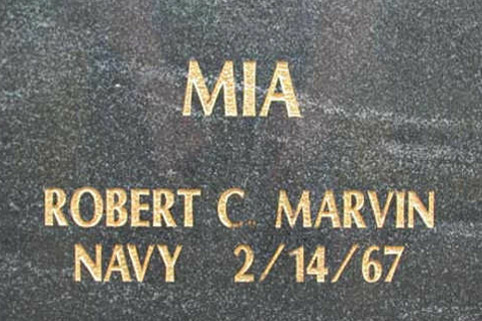 Robert's body was never recovered, but his name is listed on the Vietnam Memorial as "Missing In Action (MIA). His name also appears on the Vietnam Memorial in Washington, DC on Panel 15E Line 028. Lt. Marvin - I do not know you - we have never met - but in your rememberance I wear your name on a silver bracelet everyday. You have not been forgotten.